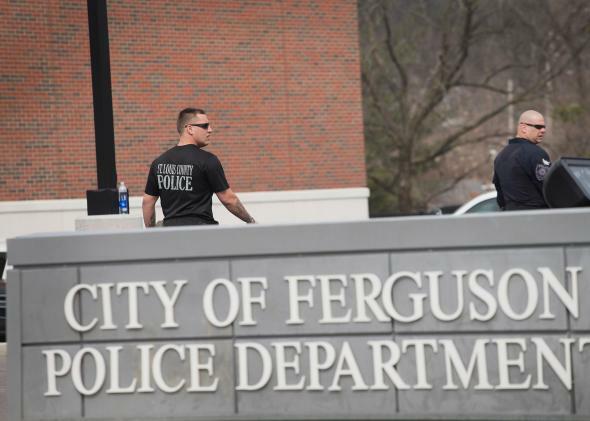 Jeffrey Williams: 20-year-old charged with shooting of Ferguson police officers. Police officeers secure the crime scene outside the police station after two officers were shot and wounded on March 12, 2015 in Ferguson, Missouri. Police have arrested a man who participated in a protest outside the Ferguson police station and charged him with two counts of first-degree assault for allegedly firing the shots that wounded two police officers just after midnight on Thursday. Jeffrey Williams, 20, denies he shot at the police officers, saying he fired the gun as part of a different altercation. Williams, who allegedly confessed to firing the shots, was on probation for receiving stolen property but failed to report to his probation officer for seven months, notes NBC affiliate KSDK. Two police officers were wounded just as a peaceful protest was ending last week. The two officers were standing close to each other in front of the Ferguson Police Deparmtent when they were wounded. A 32-year-old officer from the St. Louis suburb of Webster Groves was shot in the face, while the other officer, who is 41, was shot in the shoulder. The officers were released from the hospital about nine hours later.